For Supersport riders who need to have confidence in their tyres whether it’s wet or dry, the Qualifier II is the ultimate solution. Designed to help demanding riders cope with the ever advancing Supersports machines, the Qualifier II delivers everything the modern sports rider needs in performance terms whilst not sacrificing reliability and tyre life. 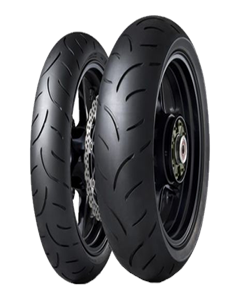 Taking cutting edge technology from the world dominating D211GP race tyre, the Qualifier II brings MultiTread (MT) compound to the street, giving faster warm up times, outstanding traction, more grip and longer life from the word go. Qualifier II incorporates Carcass Tension Control System (CTCS) high technology, allowing specific areas of the tyre to be tensioned to different stiffness, meaning high speed corners now come with more grip and more stability as standard.